Looking for a quick meal that’s both healthy and tasty? look no further. People aren’t always willing to sacrifice a flavor-packed experience for a healthy one. Tahaza provides an alternative that allows people to eat well both in terms of what they’re putting in their bodies and in their mouths: all at a price-point that challenges the assumption that eating healthy has to be more expensive. This concept lies at the core of the brand and is captured in the tagline: Healthy. Not Boring! 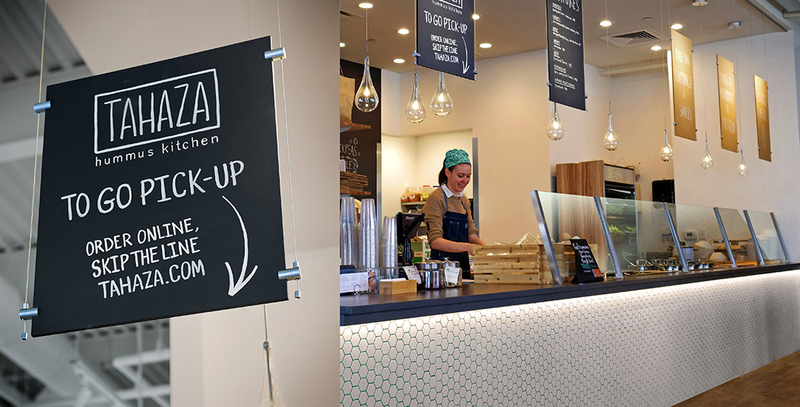 With a Mediterranean menu focused on hummus, Tahaza is delivering on its promise of a healthy alternative that is both unique and flavorful. Tahaza takes a modern twist on Mediterranean design and flavors. The restaurant’s build-your-own hummus bowl, salad or wrap approach allows people to create flavorful meals. While proteins including All-Natural Chicken, Slow Cooked Beef, and Lamb are available, Tahaza provides a wide range of vegetarian options that are equally satisfying and delicious. 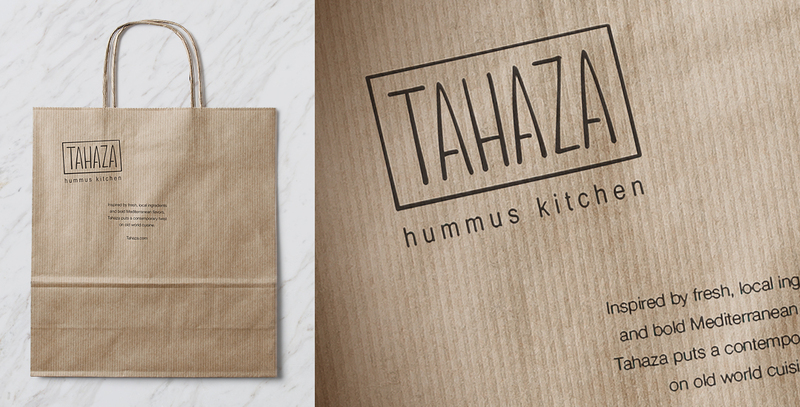 With clean simple graphics that serve more to support than overwhelm, the focus of Tahaza’s brand identity is to let the food be the star of the show. With subtle design cues that reflect the artisan nature of the menu, Tahaza’s design strategy is to be authentic to Mediterranean design – using materials that reflect those from the eastern Mediterranean region. 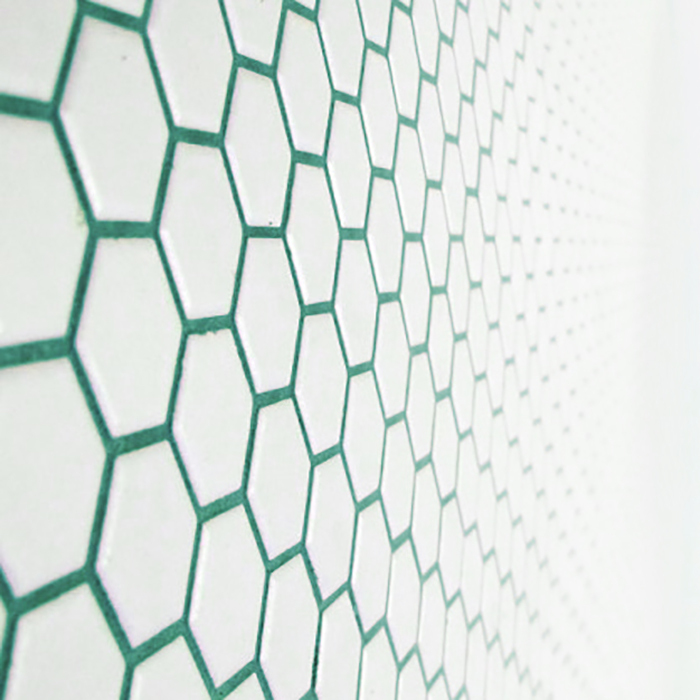 Tahaza green was designed to fit into the space and stand out as a brand signal. By incorporating the color into less obvious, but subtle applications it’s omni present without overwhelming. 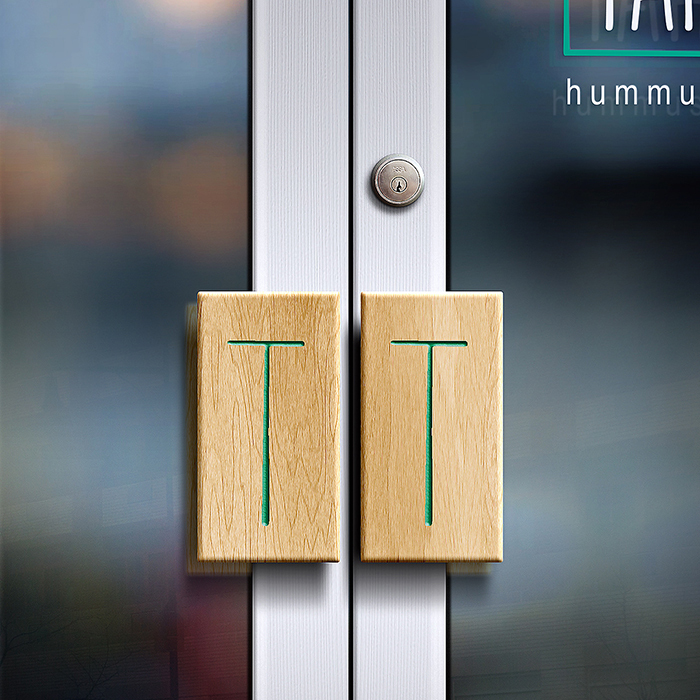 The Tahaza standalone mark was incorporated into the restaurant’s door handles creating a brand signal that extends the signage system to be more “hands-on”. While the Tahaza logotype is the brand’s primary mark, two versions of the standalone mark compliment the system; the standalone T mark (left) and the solid T mark (right). 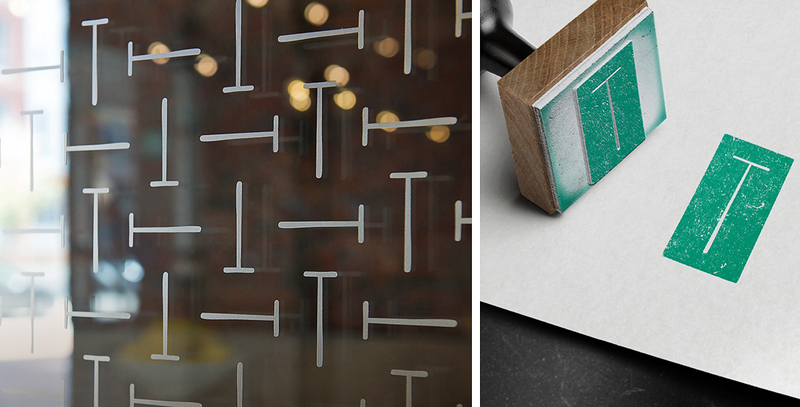 From rubber stamps to embossing stamps, Tahaza’s brand identity embraces a rustic yet refined look that reflects its food and its retail stores. Throughout Tahaza’s identity, the logotype is leveraged to create a visual language. 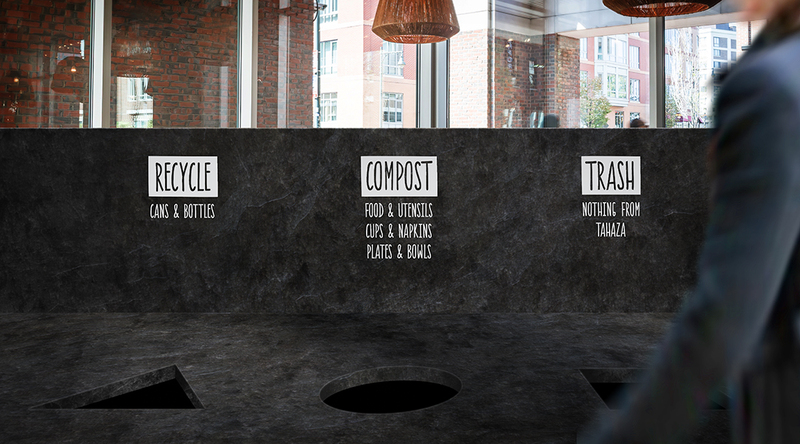 This extends from recycling, compost & trash to menus and bathroom signs.